Homo History: Jean Cocteau and Jean Marais, The First Modern Gay Couple. Jean Cocteau and Jean Marais, The First Modern Gay Couple. To understand the relationship between Jean Cocteau and Jean Marais, you need to know a little about the artistic genius who was Cocteau. Jean Cocteau was born in 1889 to a middle class family living in a small village outside of Paris. His father was a lawyer, but also a great lover of the arts like most of the members of the family. He committed suicide when Cocteau was just ten, forever changing his son's life. By then, the family was already living with Cocteau’s mother’s family in Paris. Cocteau was bored an uninspired in school and eventually he failed to pass his final examination… several times. Without a strict father to keep him in line, Cocteau was free to discover himself. While living at home with his mother, the young Cocteau drew in his notebooks and wrote poetry. Cocteau’s education took place in the cafes, theaters, salons and galleries of Paris. In 1908, at the age of 19, Cocteau’s mother introduced him into Paris Society and he instantly earned a reputation as a dandy. Cocteau had a few minor affairs with women and then moved on to dating older, well connected men such as the famous actor Eduard De Max. De Max introduced Cocteau to the who's who of the Paris scene. He also used his influence to organize a morning of poetry devoted to the young Cocteau was hailed as a great success in literary circles. 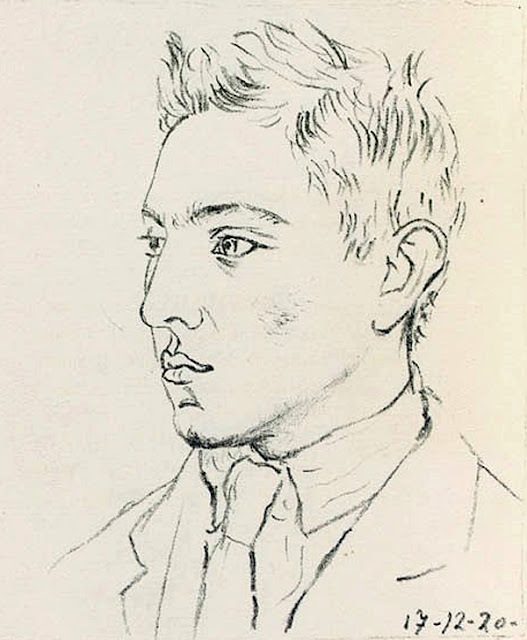 Soon Cocteau published his first poem and began contributing his poems and drawing to literary magazine. De Max also helped Cocteau publish his first three books of poetry. Cocteau’s next obsession was the 15 year old Raymond Radiquet. The pair wrote four very successful novels while living together. 1923 Radiquet died of typhoid. Not all of Cocteau’s lovers were talented or successful. Maurice Sachs robbed Cocteau’s apartment then went on to write “Witches Sabbath,” a blistering account of their relationship. Sachs was eventually killed by the Nazis. Les Enfants Terrible, the novel published in 1929 and then adapted into a film by Jean-Pierre Melville , was largely inspired by the family life of his next lover, Jean Bourgoint. Cocteau’s relationship with Bourgoint didn’t last long and Bourgoint eventually became a Trappist monk and worked in a leper colony in Cameroon. By 1927 Cocteau was living with the poet Jean Desbordes. Desbordes' J’Adore, written in 1928, was known as a 200 page love-letter to Cocteau. “I come everywhere, in the gardens and on my body; it is a carnal prayer.” It was very risque stuff for 1927. Desbordes and Cocteau summered in the French countryside with Gertrude Stein and Coco Chanel. Chanel was irritated that the two men spent most the day locked in their room smoking opium. Desbordes went on to become a Resistance leader during WWII. Tragically, the Nazis captured him, plucked his eyes out and then killed him. Through out all his many relationships, Cocteau was constantly evolving as an artist, playwright and eventually film-maker. In 1930 he completed his first cinematic masterpiece, Blood of the Poet. It's apparent that Cocteau's film was heavily influenced by his friendship with many of the Surrealists and Dadaist. Jean Marais was born in the ancient port town of Cherbourgh in 1913. His parents separated after his father came back from WWI and his mother moved Marais and his brother to Paris. Mentally unstable and unable to always get regular work, his mother became a shop-lifter and was in an out of jail several times. Marais and his brother were left alone a lot as children and had to learn to fend for themselves. Expelled from school for dressing as a girl and flirting with a male teacher as joke, the young Marais took theater classes while working odd jobs such at sketch artist, newspaper boy, photographer and occasionally actor. In 1933 Marcel L’Herbier gave Marais his first small part in a film; soon other parts would follow. In 1937, a 24 year old Marais saw a show of Cocteau drawings and was so taken with them he decided that he had to meet him. I doubt that's the real story, remember that Cocteau was already quite famous at that time and Marias was just starting out. Later in life, Marais admitted that even though he was no gigolo, he saw Cocteau as an opportunity, at least in the beginning. However, within ten days of meeting Cocteau, Marais had completely fallen in love with him. Cocteau and Marais soon became the most notorious couple in Paris. Their relationship was extremely intense and very rarely calm. Cocteau saw Marais’ potential as an actor and immediately started crafting roles for him in his movies. Up until meeting Marais, Cocteau had relied on opium to find inspiration and he had developed a heavy addiction. Having Marais as his new muse, Cocteau was able overcome his addiction to opium. Both Cocteau and Marais decided to stay in Paris during the Nazi occupation in spite of the great danger; everyone knew that they were a gay couple. Cocteau had some powerful admires who protected the two of them, even when Marais punched a collaborationist critic for writing a bad review of one of Cocteau’s plays. Their names were dragged through the mud in the Nazi controlled press, but they were never arrested or set off to a concentration camp. Marais claimed that when he tried to join the Resistance that he was rejected for being gay. Apparently the rejection had more to do with his reputation for speaking openly, a trait that could have had dead consequences for others in the Resistance movement. In 1996, Marais appeared in his last film, Bernardo Bertolucci's Io ballo da sola (Stealing Beauty.) He passed away on November 8, 1998 at aged 84. He is survived by his adopted son, Serge Marais. It wasn't unusual to find gay couples in Paris at the time Cocteau and Marais were together , but it was unusual to find a gay couple who were so openly living together, working together, traveling and vacationing together like a married couple. How many closeted Hollywood movie stars still don't have the nerve to live openly like Cocteau and Marais managed to do 75 years ago? Unlike Gertrude Stein and Alice B. Tolkas, Cocteau and Marais never bothered being discrete, they were unapologetic about who they were; they were the first modern gay couple! The new Musée Jean Cocteau in Menton France. All of Jean Cocteau's films have been restored and are available through The Criterion Collection. THANK YOU Jeffrey for this fascinating synopsis about the life of Jean Cocteau, especially his openly Gay relationship with Jean Marais. My all time favorite film is Beauty & the Beast and the links, photos and movie posters are all superb. I imagine Couteau would be so proud to have his story told in such fashion. Have you ever considered EDITING the Wikipedia write up about Cocteau.....they don't even mention the work Gay! thanks for the great read...very informative. Happy Pride! Really well written and fascinating. Makes me want to pull out my French books and learn more about them and all their friends. 30 Vintage Pics of Gay Couples added today! 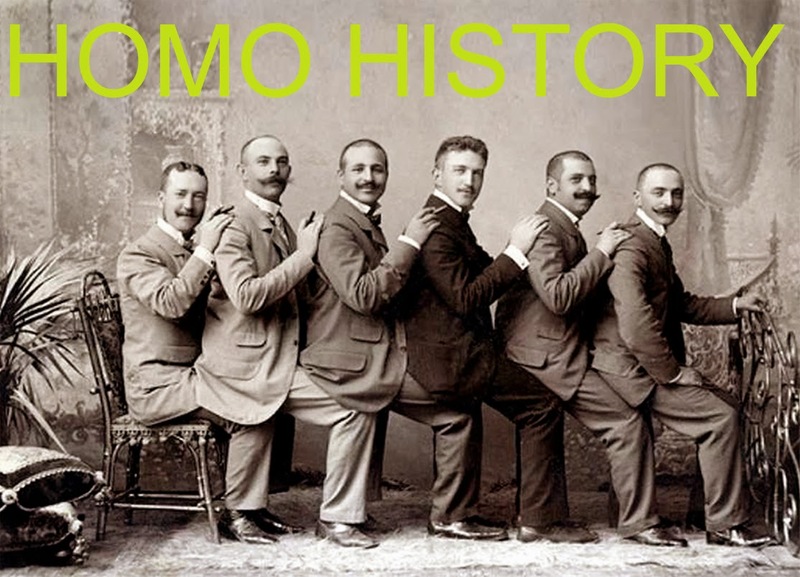 The latest batch of Vintage Gay Couples! Batman and Robin, Super Gay? More Vintage Photographs of Gay Couples! Our latest batch: Photos of Vintage Gay Couples!